How does one distill the essence of a company that dates back to 1780 into eight chapters? It is a mammoth task, but the team at French jeweller Chaumet has adeptly risen to the challenge with Les Mondes de Chaumet (The Worlds of Chaumet) exhibition that recently opened at the Mitsubishi Ichigokan Museum in Tokyo, until September 17, 2018. The exhibition explores the storied legacy of the French maison, and divides its varying themes, inspirations, and jewels into eight distinct chapters that recount its history in the context of the world, corroborated by bejewelled examples from its substantial archives. The history of the French jeweller is intrinsically linked to Napoléon and his reign as an emperor, and a significant portion of the chapters delve into the landmark appointment of Marie-Étienne Nitot (founder of the maison) as court jeweller. But perhaps the room that elicited the most gasps was the one with all the tiaras. Lining the wall were some hundred-odd tiara moulds that the jeweller had made (Chaumet was the first jeweller to create and keep these moulds), and opposite, guarded safely within glass displays, was a wealth of crowns for the aristocratic class. Whittling down to our favourite pieces from 300 jewels, artefacts and art on display was certainly not easy, but here are five that should not be missed, for their aesthetic beauty and their historical significance. 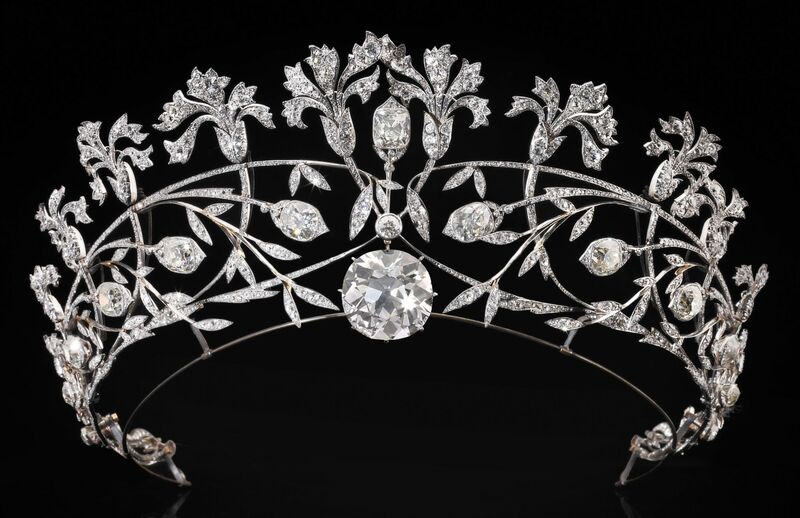 Commissioned by Emperor Napoléon for Pope Pius VII, this papal tiara was designed by Nitot & Fils (before it took on the name of Joseph Chaumet, the company was initially called Nitot & Fils), featuring some 3,345 gemstones and 2,990 pearls, including a 414-carat emerald that has since been sold by Pope Benedict XV to raise funds for the victims of the First World War. It was upon seeing this tremendous headpiece that Joséphine, wife of Napoléon, bestowed upon Marie-Étienne Nitot the honour of court jeweller. When we asked curator of Chaumet’s archives Béatrice de Plinval her favourite piece from the exhibition, she diplomatically answered that she loved them all. But upon gentle prodding, she admitted to having a soft spot for this Indian bayadère necklace: “It is sophistication, it is a pure fashion accessory (more than a social emblem), it is a masterpiece, it is so feminine, it is fragile, it’s wonderful,” she told us. It was only in the early 1900s that an artistic exchange between the French jewellers and the royal houses of Japan and India blossomed. In fact, French jewellers would travel to India to discover the spectacular stones and parures owned by the maharajahs, who had acquired some of the most incredible diamonds, rubies and emeralds of the time. Chaumet had the honour of being the first French jeweller to go to India, and this majestic Bayadère necklace is just one of the many spectacular creations made for the maharajahs. Named after the tasselled chains worn by Hindu dancers, the necklace is constructed with natural seed pearls (it took the maison 30 years to find all of them), platinum, sapphire cabochons and rose-cut diamonds. The curators from Chaumet’s heritage department tell us they were most intimidated to touch this necklace due to the delicate nature of the seeds, and the fact that the needles required to thread the pearls are no longer in production. In Chaumet’s history, Jean-Valentin Morel’s name stands out for his grandiose jewels and artefacts that dutifully followed the Renaissance-genre of the 19th century. Within the chapter called Chaumet’s Distant Horizons, one of the rooms is adjacent to a smaller one fitted with a fireplace, and there, only one object takes centre stage: the Hope Cup, which was made from 1853 to 1855 for Henry Thomas Hope. He requested for his family motto—“but all hope is not lost”—to be artistically rendered onto the cup, which serves as a canvas for the Greek myth of Perseus and Andromeda. This masterpiece is truly a feat of opulence and artistic mastery, as a bloodstone cup serves as the base around which gold and enamelled figures represent the mythology. While Morel was not one of the more commercially viable heads of the house, his creative vision, ingenuity, and innovation lives on in such artefacts—in fact, Chaumet tells us that the cup recently underwent a procedure to determine the damage that time has inflicted upon it. They discovered a golden rod in the centre of the piece—almost unheard of in that era—that has kept it standing until today. Genius. There are several motifs that appear time and again within Chaumet’s repertoire, and the wing is one of them. Symbols that evoked the beauty of nature flourished under the keen eye of Joseph Chaumet, and he appropriated these motifs to herald the era of Belle Epoque and beyond. This particular jewel, where platinum, diamonds, and enamel are articulated to resemble the wings of a majestic bird, was created for Gertrude Vanderbilt, of the American Vanderbilt and Whitney fortunes, in 1910. The French Revolution might have been sparked in part by the lavish lifestyles of the royal family, but within their treasure chest were artworks and artefacts that hold tremendous historical value today. In fact, in 1793, the French government sought the expertise of Nitot to evaluate the artefacts that had once belonged to Marie-Antoinette, and within the collection, he found a set of 17th-century Japanese lacquers that were on the verge of being destroyed. He requested that they be saved, reporting at that time: “All these objects are magnificent ornaments, well-suited to enriching the collection of the Musée National not just in terms of the singularity and nobility of the materials and forms, but also regarding their actual value. The beautiful craftsmanship and complexity of the work mean they are of greatest importance.” The lacquer box displayed here is a masterpiece of gold and silver maki-e.